Many of the polystichums described here are already in cultivation and, though relatively unknown, all offer promise for gardens and inspired growers throughout temperate regions. In addition to the above, there are a number of currently unidentified species arriving from China, and specifically from Yunnan, including several ornamental prizes that are in cultivation in Europe. 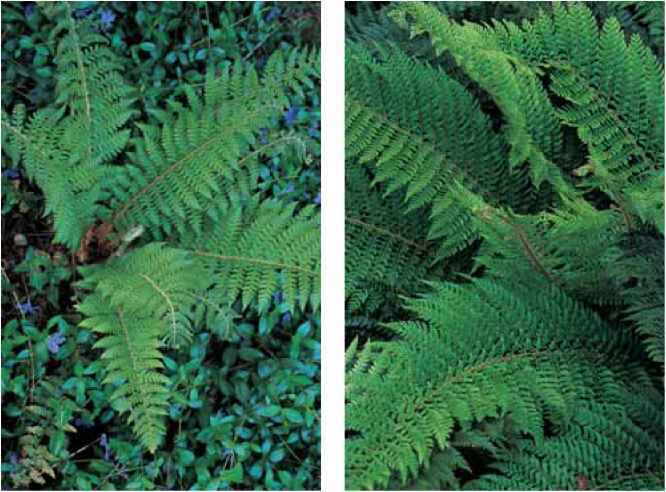 Hybrids traditionally are vigorous and easy additions to the horticultural palette and the Polystichum progeny contribute a varied assortment. With many of the world's species growing in close proximity to each other and with contributions from science, including artificially created laboratory hybrids, they have produced an interesting range of intermediates. These mostly sterile offspring offer an intellectual challenge both in the field and in the garden in figuring out who's who among the hybrid generation. Simply stated, look for intermediate characteristics between the presumed parents. 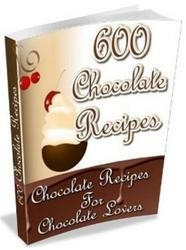 It is definitely not as easy as it might sound, but should keep the mind sharp and eye alert. Bright fronds of Polystichum xiphophyllum shine in the woods in the Kennar garden. Polystichum acrostichoides x P. proliferum showing the bulbil sprouting on the frond in the Peters garden. Polystichum andersonii X P. braunii. without the constricted terminal pinnae and with distinct rather than confluent sori. And, most fortunately, the fronds bear bulbils. Polystichum acrostichoides X P. proliferum, also from the experimental breeding program of Anne Sleep, is evergreen, sterile, and bulbiferous. 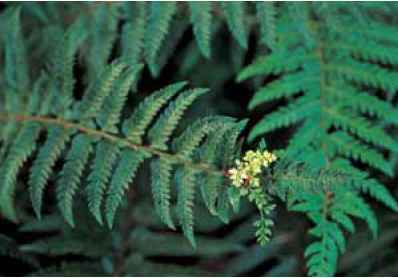 The fronds of 2 ft. (60 cm) or more are bipinnate. This is easily cultivated in shade in Zones 6 to 8 and very readily propagated from the single bulbil on frond tips. Polystichum alticola (high dweller) is an evergreen alpine from the rocky heights of the Drakensberg Mountains of South Africa. Bipinnate, light green, and ranging in height from 1 to 2 ft. (30 to 60 cm), it has great potential for partially shady rock gardens in Zones 8 and 9. Polystichum andersonii X P. braunii is a sterile, bulbifer-ous, evergreen hybrid that was produced by Anne Sleep. The lax 2-ft. (60-cm) fronds, like those of P. braunii, are bipinnate, broadest in the middle, and tapering at both ends. This fern brings good looks and collector's joy to cool shade gardens in Zones 6 to 8. One or occasionally more bulbils are produced on the tips of mature fronds and are easily rooted. Polystichum xbicknellii in the Peters garden. duce bulbils sparingly. It is an attractive hybrid for shade in Zones 6 to 8. Polystichum andinum (from the Andes) grows in woods in the subantarctic mountains of Chile and Argentina. Foot-tall (30-cm) fronds develop in tufts and are once-pinnate to pin-nate-pinnatifid with pinnae that are often imbricate. Stipes have golden scales. This species is potentially challenging to cultivate and should be tested in Zones 6 to 8 with good drainage and gritty soil. Polystichum xbicknellii (after Clarence Bicknell, 1842-1918, of Britain) is a sterile hybrid between P. aculea-tum and P. setiferum. It occurs in Europe and Britain in areas where both parents are present and can easily be confused with either. Its abortive spores separate it. Evergreen and variable, it conducts itself, when available, handsomely and with ease in gardens in Zones (5) 6 to 8. Polystichum bonseyi (after Edwin Bonsey) is a 2- to 3-ft. (60- to 90-cm) evergreen from the higher elevations of Maui, Hawaii, where it grows in mesic wet forests and subalpine scrub. It has stipes densely clothed in red-brown scales and lanceolate bipinnate blades of flat green. Gardeners in Zones 8 and 9 should be able to cultivate this fern in moist shade, as it has been successfully grown in central England for many years. Glossy sheen, similar to that of Polystichum polyblepharum, illuminates the fronds of P. discretum in the Kohout garden. Polystichum chilense (of Chile), from southern Chile and Argentina, is evergreen and from 18 to 24 in. (45 to 60 cm) tall. Stipes are covered with large scales and the ovate-lanceolate blades are bipinnate to tripinnate. This is a candidate for cultivation in Zones 7 and 8. Polystichum discretum (discrete, separate), synonym P.ni-gropaleaceum, is a leathery 2- to 4-ft. (60- to 120-cm) evergreen from Asia especially common in moist, humusy deep shade. The stipes have linear light brown to almost black scales rather than the broad scales that are so common on many polystichums. Shiny, lanceolate blades suggestive of P. poly-blepharum are bipinnate with serrate and spinulose pinnules. New growth is early and needs protection from late frosts. Cultivate this in Zones 6 to 8. 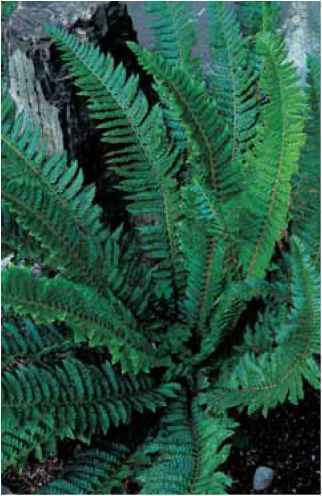 Polystichum dracomontanum (of the Drakensberg Mountains) is an erect, colonizing evergreen up to 3 ft. (90 cm) tall. Stipes scales are straw-colored and blades are broadly lanceolate, leathery, and bipinnate. Cultivate it in compost and shade in Zones 6 to 8. Polystichum drepanum (sickle-shaped) comes to us as a rarity from the Madeira Islands. It is a 2-ft. (60-cm) evergreen for trials in Zones 8 and 9, and has bipinnate, triangular foliage. Young plant of Polystichum dracomontanum in the Jessen garden. Polystichum drepanum in the Gassner garden. Polystichum duthiei (after John F. Duthie, 1845-1922, who collected in India) is an exceptionally rare (and consequently greatly appealing) bushlet of an alpine from the higher elevations in the Himalayas and China. Stubby 6-in. (15-cm) once-pinnate fronds have bunched pinnae with the whole encased in varying degrees of pale brown scales. In addition, the upper frond surface bears small white glands. As of this writing this species is not available in the trade, but the illustrations and description are so attractive that I would like to encourage its distribution. The habitat parameters are defined as up to 21,000 ft. (6300 m) in damp sites and under rocks, so it should be hardy. 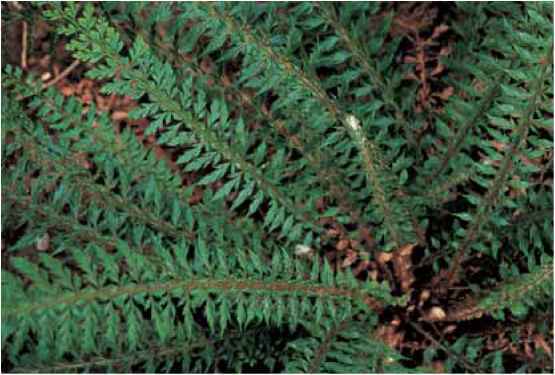 Polystichum fallax (false, deceptive) is an Australian native inhabiting rocky areas in open forests. 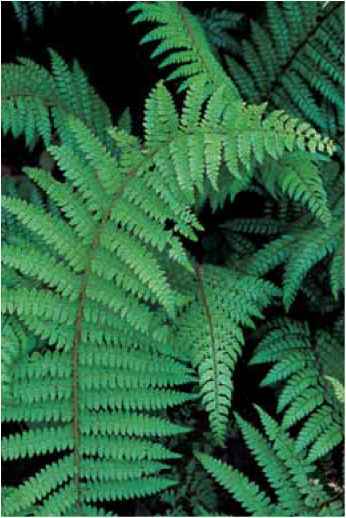 Fronds are lanceolate to 2 ft. (60 cm) with glossy, evergreen, bipinnate to tripinnate foliage. The species should be hardy in Zone 9 and, with protection, possibly Zone 8 as well. Polystichum formosanum (of Formosa) is a small, 1-ft. (30-cm) evergreen with slender, wiry stipes and once-pinnate narrow blades. It grows in dense, mossy duff in forests of China, Taiwan, and Japan and should adapt in Zone 8 and possibly Zone 7. Polystichum haleakalense (after Mount Haleakala of Hawaii) has shiny, dark green, lanceolate, bipinnate to bipin-nate-pinnatifid blades on short tan-scaled stipes. 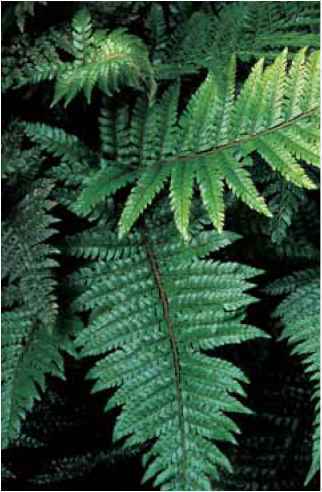 The fronds range from 8 to 18 in. (20 to 45 cm) tall. This high-mountain native has been successfully grown in England for over a decade and is worth trying in Zone 9 or well-mulched Zone 8. Polystichum hancockii (after Hancock) is an evergreen with stipes one-half the length of the 2-ft. (60-cm) fronds. Blades are once-pinnate with an elongated pair of bipinnate basal pinnae rather like a reduced P. tripteron. This species grows in moist to wet areas in Japan, China, and Taiwan and is successful in European gardens in Zones 7 and 8. 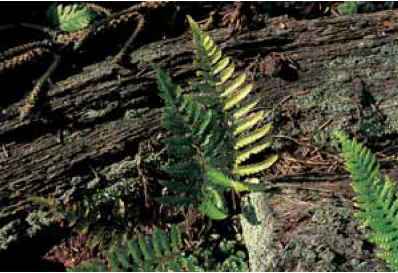 Polystichum lachenense (milk-like), Aleutian holly fern, is a dwarf species with brownish-purple 2- to 4-in. (5- to 10-cm) stipes and 8-in. (20-cm) linear-lanceolate, once-pinnate to bipinnate blades. Old (dead) stipes and frond material are persistent and serve as indicators for identification purposes. This rare alpine has a native spread from the Himalayas, Burma (Myanmar), China, Taiwan, and Japan to the Aleutians. In all situations it prefers good drainage and rocky rubble and should be given comparable grit in gardens in Zones 6 to 8. Polystichum xlonchitiforme (long shape), a sterile hybrid, combines attractive features from both parents with its sheen from P. lonchitis and arching fronds from P. setiferum. The narrow 2-ft. (60-cm) fronds are evergreen with pinnatifid blades. The hybrid is easier to domesticate than P. lonchitis and grows in average well-drained loamy soil in partial shade from Zones 5 to 8. I look to tissue culture to introduce it to a broader (and eager) gardening public. Polystichum xluerssenii (after Christian Luerssen, 1843-1916, a botany professor at Leipzig) is a hybrid between P. aculeatum and P. braunii. Growing to more than 2 ft. (60 cm), this evergreen, bipinnate fern tapers in the manner of P. braunii and is very scaly. It is European in origin and hardy in shade in Zones 6 to 8. Polystichum longipaleatum (long scales), synonym P.seto-sum, joins an illustrious group of shiny foliaged, showy evergreens that are garden worthy even as their botanical classification changes periodically. This Asian from China and the Himalayas has golden scaled, 6-in. (15-cm) stipes bearing bipinnate, broadly lanceolate, hairy 18-in. (45-cm) blades crowded with 40 pairs of linear pinnae. Introduce it to shade and rich soil in Zone 6 to 8 gardens, where it is well worthy of experimentation. 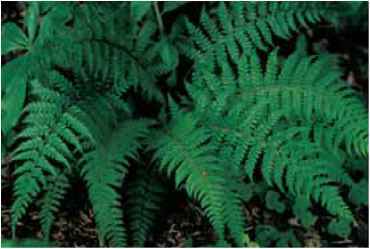 Polystichum manmeiense is a 3-ft. (90-cm) evergreen with equal parts brown-scaled stipes and lanceolate, bipinnate medium green blades. It is currently rare, and the material described is from Christopher Fraser-Jenkins's introductions to Britain. Gardeners in Zone 8 should find it hardy as it grows in the Himalayas as well as China, Taiwan, and the Philippines. 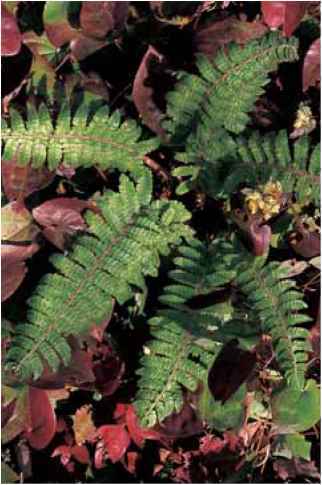 Polystichum mehrae (after Indian botanist P. N. Mehra, b. 1907), synonym P. acanthophyllum, is a charming low-growing spiral of 1- to 2-in. (2.5- to 5-cm) wide once-pinnate (rarely bipinnate) 1-ft. (30-cm) fronds with practically nonexistent light brown, heavily scaled stipes. The curved fronds that cling to rocks are the identifying and seducing feature of this high-altitude Himalayan, Chinese, and Burmese (Myanmarese) evergreen. It has tremendous potential for dedicated rock gardeners to introduce to shade and granular soil in the "rare plant section" of the garden, alpine house, or any area without high humidity. In Zone 6 it needs winter protection, but it should be willing in Zones 7 and 8. Remember to give it good drainage. Polystichum xmeyeri (after Dieter Meyer, 1926-1982) is a hybrid between P. braunii and P. lonchitis. This narrow, bipinnate evergreen with fronds to 2 ft. (60 cm) tapers strongly at the base. It is easier to cultivate than its P. lonchitis parent and can be grown in partial shade in Zones 6 to 8. Polystichum monotis (one ear) from China is an evergreen 1-ft. (30-cm) dwarf detailed in Rickard (2000) that will hopefully be available commercially. It is described as narrowly triangular, dark green, and once-pinnate with a detached auricle somewhat similar to a miniature P. xiphophyllum. There is good potential here for gardeners in Zone 8. Polystichum monticola (mountain loving), the mountain shield fern from high-elevation exposed rocky mountainsides in South Africa, is a bipinnate to tripinnate evergreen with arching fronds of up to 30 in. (75 cm). The stipes are covered with rusty scales distinguishing it from P. alticola. Despite its provenance, it prefers light shade in Zones 8 and 9. Polystichum multifidum (much divided) is an evergreen from South America with broadly lanceolate tripinnate to quadripinnate 2-ft. (60-cm) fronds. Var. multifidum is densely scaly and var. pearcei is sparsely scaly. The species and its hybrid with P. chilense are attractive shadelanders for Zones 7 to 9 or, with substantial mulch, Zone 6. Polystichum ovato-paleaceum (ovate scales) is a close relative of P. retroso-paleaceum and similar to it except for having large upward-pointing ovate scales on the upper stipes and rachis that are not adpressed downwards. (Think standing ovation!) It is from Japan and Korea and has been successfully propagated and cultivated in Pacific Northwest gardens in Zone 8. Polystichum xlonchitiforme in the Jessen garden. Polystichum Xmeyeri in the Kohout garden. tion, P. yunnanense has small but visible cavities above each sorus on the upper frond surface. (To add to the confusion they hybridize with each other.) Both are separated from P. discretum on the basis of having broad scales rather than narrow, linear ones. All do well in light shade and good soil in Zones 6 to 8. Polystichum ovato-paleaceum surrounded by the yellow spring flowers of Epimedium Xversicolor 'Sulphureum'. Polystichumplicatum (plaited), synonym P. mohrioides, comes from high elevations in the Andes. Fronds grow to 1 ft. (30 cm) tall with one-third being scaly stipes. Blades are ovate-lanceolate and bipinnate. Here is a species for rock garden type culture in partial shade, with good drainage, in Zones 7 to 9. Polystichum xpotteri (after Potter), Potter's holly fern, is a sterile hybrid between P. acrostichoides and P. braunii. From North America, it brings with it the soft-textured influence of the P. braunii parent, albeit with longer stipes and a less tapered blade. 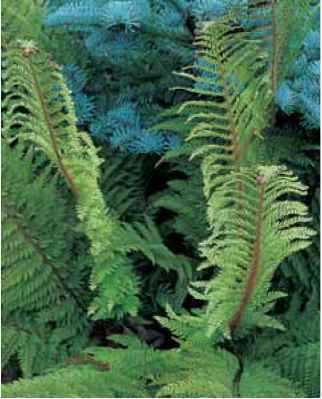 With 2-ft. (60-cm) evergreen fronds, it is hardy and especially welcome in the colder regions upwards from Zone 3, although, like P. braunii, it is unsuitable for humid and hot gardens. It should acclimate wherever P. braunii flourishes. Polystichumprescottianum (after Prescott), Prescott's holly fern, is a compressed soft green alpine about 1 ft. (30 cm) in height. The fronds grow in upright clusters in partially sunny high-altitude exposed rocky sites in the Himalayas, Taiwan, China, and Afghanistan. The blades are pinnate and the very short stipes are scaly. Although very rare in cultivation this would be a charming specimen for close viewing in a container or alpine trough in Zones 6 to 8. Polystichumpseudo-makinoi (false Polystichum makinoi) is a 2- to 3-ft. (60- to 90-cm) evergreen from the mountain forests of Japan and China. The stipes are covered with dull brown scales. Blades are oblong-lanceolate and bipinnate. They are not shiny. German specialists have been successfully cultivating this in Zones 6 to 8. It hybridizes with P. tagawanum to form the stunning R xkiyozumianum. Polystichum semifertile (half fertile) is a lowland Asian and Himalayan evergreen that has been grown successfully in England. 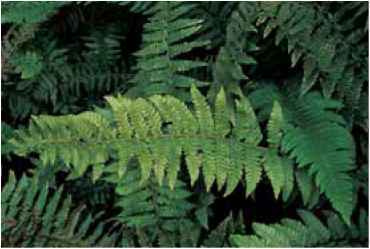 The fronds are evergreen and up to 18 in. (45 cm) in height with the lower stipe portions covered with tan-trimmed black scales. The blades are lanceolate and bipinnate with unusual "fertile" fronds that are described by Christopher Fraser-Jenkins (1997b) as being one-third to one-half sterile. The species is growing in England and should do well in Zone 9 or protected Zone 8. Polystichum stimulans (stinging), synonym P. ilicifolium, is a small, 1-ft. (30-cm) evergreen with very narrow 1-in. (2.5-cm) holly-like, leathery pinnae on once-pinnate blades. This alpine from eastern Asia and China but not Japan is recommended for lightly shaded rock gardens in crumbly soil. It is similar to P. stenophyllum but is copiously bristly. The lower pinnae do not aim downwards. 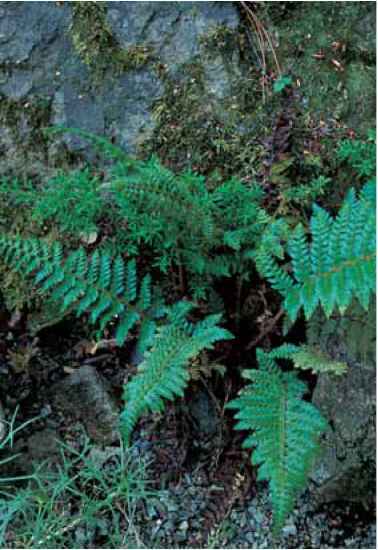 Polystichum thomsonii (after Thomson) has a lax rosette of fronds under 1 ft. (30 cm) tall and is a diminutive species for scree and lightly shaded rock habitats. The stipes are only sparsely scaly, and the narrow, once-pinnate blades have asymmetrical pinnae that are flat on the basal sides and lobed on the upper. The entire frond is fertile with large indusia. Coming from alpine territories in China, it should be tested in gardens in Zones 7 and 8.
plant where, with fronds up to 18 in. (45 cm), it is showy, manageable, and unusual. It can be reproduced by small bulbils on the frond tips. Polystichum wilsonii (after Wilson) is so densely scaly in new growth that some authors compare the crosiers to curled caterpillars. 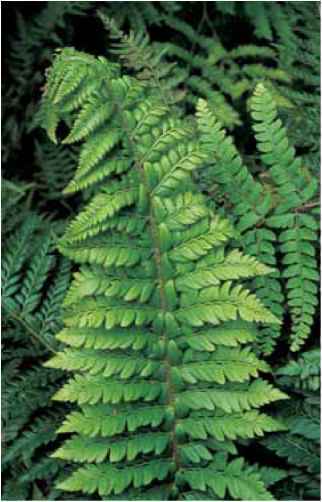 Evergreen fronds are 18 to 24 in. (45 to 60 cm) tall with scaly stipes and lanceolate, bipinnate blades. The species is native to rocky scrub in the Himalayas, China, Taiwan, and disjunct in South Africa. Gardeners in Zones 6 to 8 will find this adapts graciously to woodland cultivation. Toss in a rock or two to make it feel at home. Polystichum woronowii (after botanist Georg Woronow, 1874-1931), from Turkey, the Caucasus, and Iran, is an evergreen that has pale tan-scaled, long stipes and lanceolate bi-pinnate blades. It is just making its first appearances in the United States where it is suitable for Zone 6 to 8 woodlands. Polystichum pseudo-makinoi in the Kohout garden. Compact and densely foliated Polystichum triangulum in the Peters garden. Polystichum woronowii in the Gassner collection. Polystichum yunnanense (from Yunnan) is one of the most common polystichums of the Himalayan flora, growing at mid-altitudes wherever moist soil beckons. Two-foot (60-cm) fronds are heavily black scaled at the base, but their presence decreases rapidly higher on the stipes. Blades are lanceolate and bipinnate, ranging from blue-green in deep shade to bright green when more exposed. The species is noted for dotted indentations on the upper frond surface above the position of the sori below, a feature that separates it from the genetically similar P. piceopaleaceum. It has been thriving in benign neglect and drought in my garden for a number of years and should succeed without fuss in the woodland shade of Zones 6 to 8.